MACTWEETS: Mac Attack 9 - SING…. SING A SONG…. Mac Attack 9 - SING…. SING A SONG…. How’s about cookin’ something’ up with me? Just tell me your preference, I’ll even do cheese ! A few dozen perfect macarons…. Step into the kitchen and grab that jar of aged whites then flip on the radio. Baking is always more fun when the music is blaring, those good ol’ Golden Oldies or a a blast of rock n roll, the best sing-along pop, it all makes an afternoon spent making macarons more fun and lively. So now is the time to combine the two! Tie on that thinking cap and get those creativity juices flowing, for this month your Mac Attack challenge, if you are willing to accept it, is to take that favorite tune and bake it into a mac! We know that you can cook up somethin’ spectacular ! Just let that favorite song inspire your choice of mac flavors or colors, from a Yellow Submarine to Goober Peas to Animal Crackers or Savoy Truffle, the list is endless and the choices are delicious! So, let’s cook up something special, something toe-tapping, sing-along good! Come Friday night your appetite is needing satisfaction. Don't you waste one minute, man. Get down to Rosie's kitchen. Please have your Mac Attack post up no later than July 10 '10. 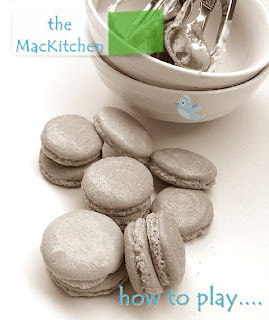 Once you have posted your Mac Attack macarons on your blog, make sure that you mention the Mactweets Mac Attack challenge in your post and link back to the Mactweets blog. Please link back to this challenge on your post. Feel free to promote the Mactweets blog by proudly displaying the Mactweets badge in your Mac Attack post as well as in your sidebar! It isn't mandatory but is a nice way to get the word out! Round up will be on July 15, 2010. Ok, after thinking maybe I couldn't think of an idea, I now have one!!! Hopefully I can pull it off! Love it. So many possibilities. Oh my gosh -just when I think it can't get any more challenging then the last one -it does ! Going to have to think on this one for a bit ! Curse you humidity! Needed FIVE batches of these to come up with a couple but I posted them all anyway. The "go" with my song - you will see what I mean!
. Thanks again for the fun challenge Deeba and Jamie! Whew! Am I the last to post? This is truly a challenge in midst of a hot humid summer. My first Mac Attack challenge! @Keksle: Yay! Thrilled you have joined us and your macs are fabulous! I wanted to leave a comment on your blog post but couldn't see where! No comments on your blog? Finally posted my Honeysuckle Rose Macs with Toblerone Ganache inspired by the great Fats Waller tune. My "Pretty in Pink" inspired Macs filled with Pink Lemonade Buttercream are finally up! Oh dear, I am late as usual! I finally posted my Brown Eyed Girls Choc & Cinnamon Macs with Ganache & Dulce de leche. I am very late but my post is up in case there is still time. my post is up! I LOVED THIS CHALLENGE!!!!! I didn't get my post up in time, it was my first successful endeavor, thanks to Barbara Bakes, so I understand if I don't make the round up, but I loved participating! Forgot to comment that my post is up. http://www.barbarabakes.com/2010/07/green-apple-and-caramel-macarons.html Thanks!!!! Thanks so much for this great theme! Mon Dieu! Will Newfound Popularity Spoil the Dainty Macaron? "MacAttack 8"... a round-up of the Wild Side! Edited By Deeba @ passionateaboutbaking.com. Awesome Inc. theme. Theme images by Colonel. Powered by Blogger.